Comments are now closed. Winner will be announced tomorrow. Thanks everyone! You would be hard pressed to find another toy company that has come up with a more creative and lucrative idea than that of the American Girl doll. Blending history with all things girly, they have the market on quality toys for little girls. I mean, really – they put Cabbage Patch Dolls to shame. Had American Girl been around when I was little, I would have been wildly in love with the dolls. Instead, I am just wildly in love with them as an adult, and thankfully I get to share them with my own daughter and watch her imagination bloom as she plays and learns through their vastly rich historical stories. Well done, American Girl. Well done. Caroline launches with six historical books written by author and social historian Kathleen Ernst and they follow Caroline’s adventures through this rich moment in American history. With Christmas quickly approaching (I know, WHAT?! ), Caroline Abbott would make a great addition to your American Girl’s collection. She has an array of historically accurate clothes and accessories that represent her time period and the books are sure to enthrall your daughters as they learn more about our country in a way that interests them. 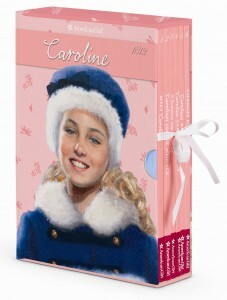 Today, thanks to American Girl, I have the privilege of offering one lucky reader Caroline Abbott’s six book box set. You can share with your daughter (or granddaughter, or niece, or cousin, or neighbor, or sister-in-law’s Aunt’s second cousin’s daughter…) these fun and lively tales that bring American history to life in a way that they can all love and understand. – Leave a comment. Any comment will do. – Send out a Tweet letting people know about the giveaway and come back and leave a second comment letting me know you tweeted and you will earn a second entry. – Post this giveaway to Facebook and come back and leave a third comment, letting me know and you will receive a third entry. This contest is open to US Residents only and will end on Monday, September 10, when I draw a random name from the list of comments. You will have twenty-four hours to respond to the email telling you you’ve won. If you do not respond, I will choose another winner. The winner will receive the box set directly from American Girl. disclaimer: I am working in conjunction with American Girl to promote the launch of their new historical doll and I’m grateful for the opportunity. I received the Caroline Abbott doll in exchange for writing this post. I was not compensated. we love american girls. they got their first ones this year they picked out McKenna. They want Caroline! My daughter loves american girls! I loved reading the American Girl books growing up. Now my daughter loves looking at the magazine hoping to get her first doll. My daughter just got her first Anerican Girl. We read all of the “Meet …” books before she chose McKenna. She would love to read about Caroline! Would love to win this! My daughter’s name is Caroline and I was just looking at this set at the book store tonight! My daughter and I would love this book set! My daughter is getting some of the old books for Christmas, this would be a great addition to her presents! I grew up with American girl dolls and books and now my daughter loves them as well. We are excited about Caroline because we love to sail as a family. My daughter is named Caroline and I am so excited for this doll. Samantha was my favorite and I was so sad she was retired until now! Um yeah! Free is AWESOME!!! This would be an awesome Christmas gift for my little girl. Shared on fb. Woo-Hoo 3 entries! I see a lot of American Girl in my future, 3 girls ages 4, 6, and 7. Fun, fun! American Girl, making me wish I was a kid again. Sign me up for the drawing, Kel! American Girl now has a doll for cancer patients and children that suffer from alopecia. Ooooo, Kennah would love this! Thanks for the opportunity to win the book! I’ll post on FB and let know. Ok, I shared on Facebook too. Thanks! My daughter’s name is Caroline, so I’m obligated to enter, right?! my daughter has Samantha, and now I’d love to get an American girl for my 4 year old granddaughther…start a tradition! Ava is getting her first American Girl for her birthday in October! Birthday girl in December wants an American girl doll like her bug sister! I loved Cabbage Patch Kids!